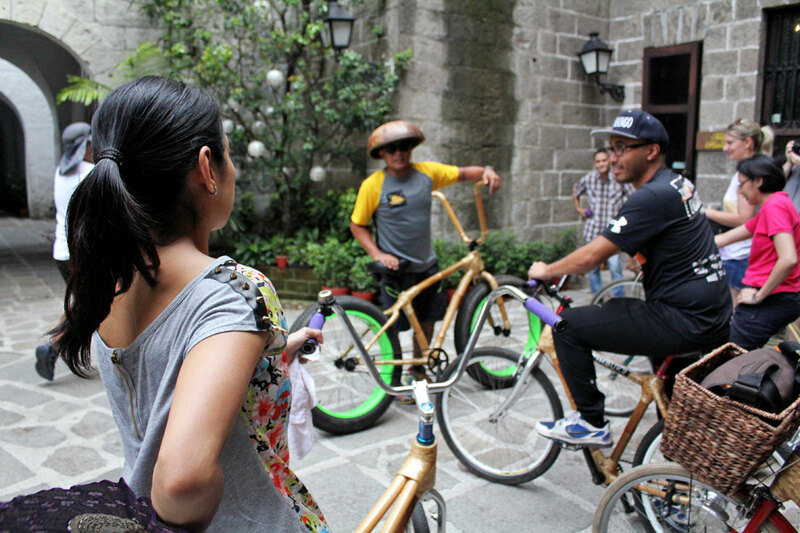 Touring Intramuros on Bamboo Bikes with Bambike Ecotours! I’ll be honest. I didn’t know much about Intramuros. At least not as much as I thought I should. I left for abroad at a young age so I never really got to study it in school. 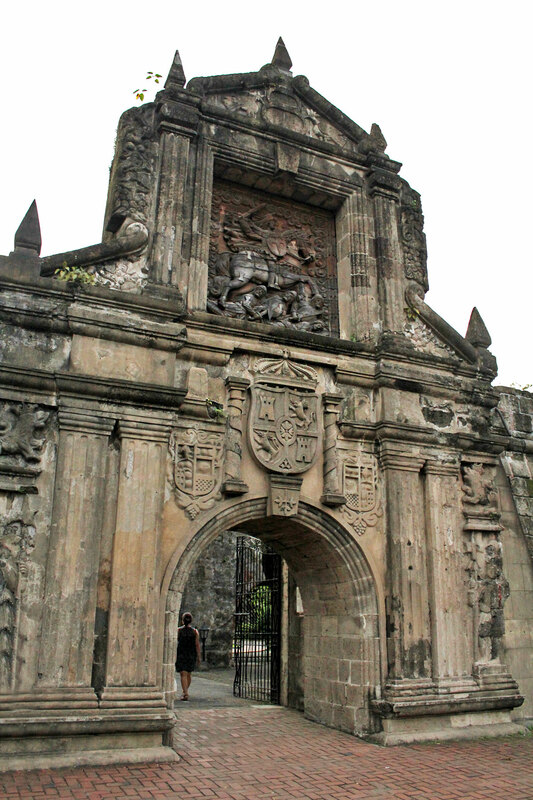 Before moving back to the Philippines in 2001, my knowledge of Intramuros was cursory at best. I knew that the word Intramuros meant “inside the walls” in Spanish. I knew that it was the seat of government during Spanish colonial rule. 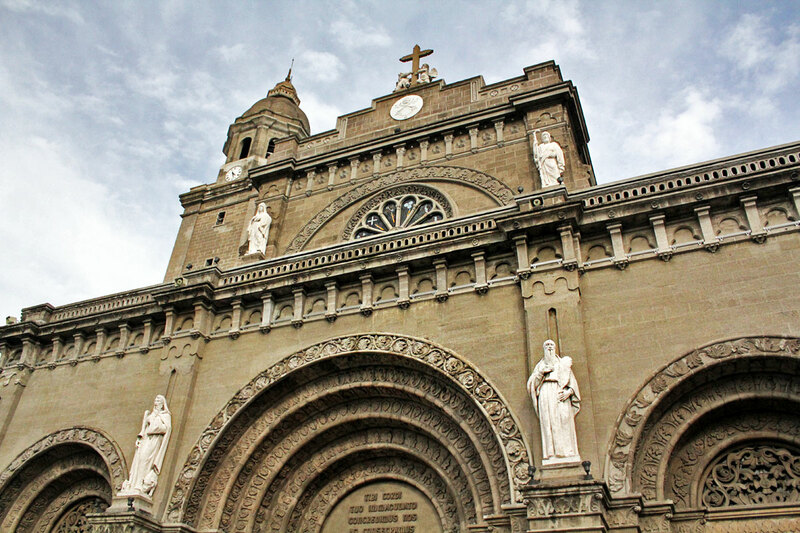 I knew that much of it was destroyed during the war but is still home to cultural treasures like San Agustin Church and Fort Santiago. 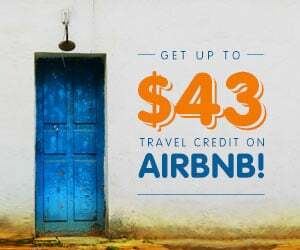 I knew that it was old — 16th century old — with cobblestone streets, leafy plazas, and Spanish colonial houses. I also knew that it was an important part of Philippine history, though just how important I didn’t fully comprehend until recently. Oftentimes, we locals are like foreigners in our own homes. For me, this was one of those times. Without a doubt the premier tourist attraction in Manila, I came to Intramuros today expecting a fun day cruising around on bamboo bikes. Little did I know that I would also leave with a more profound understanding of this historical place, and my city. 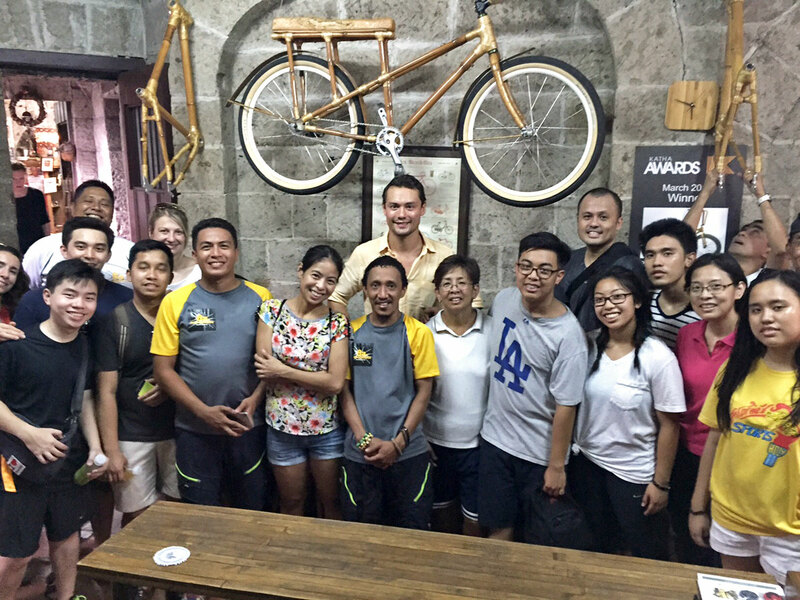 Bambike Ecotours is run by Bambike Revolution Cycles, whose office is located at the Plaza San Luis Complex in Intramuros. The tour starts here. 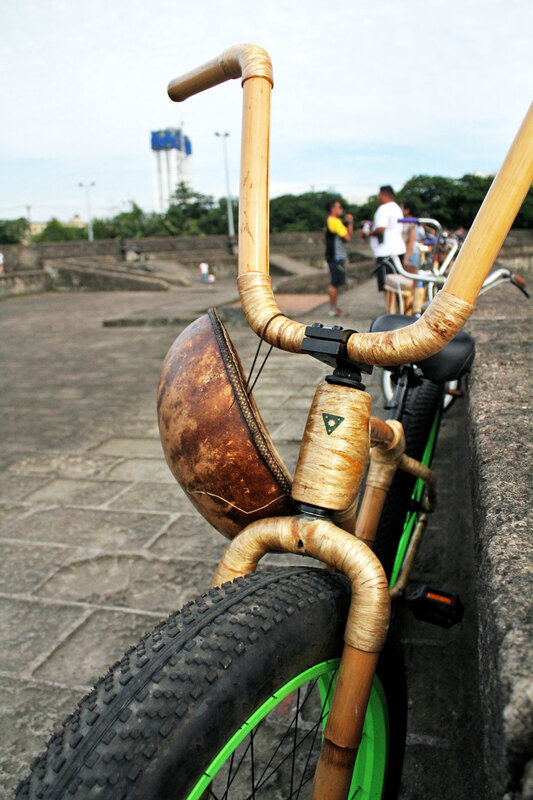 Each bamboo bike is made in partnership with Gawad Kalinga, a respected Philippine-based NGO that aims to end poverty by empowering the poor through education, values-formation, and leadership development. 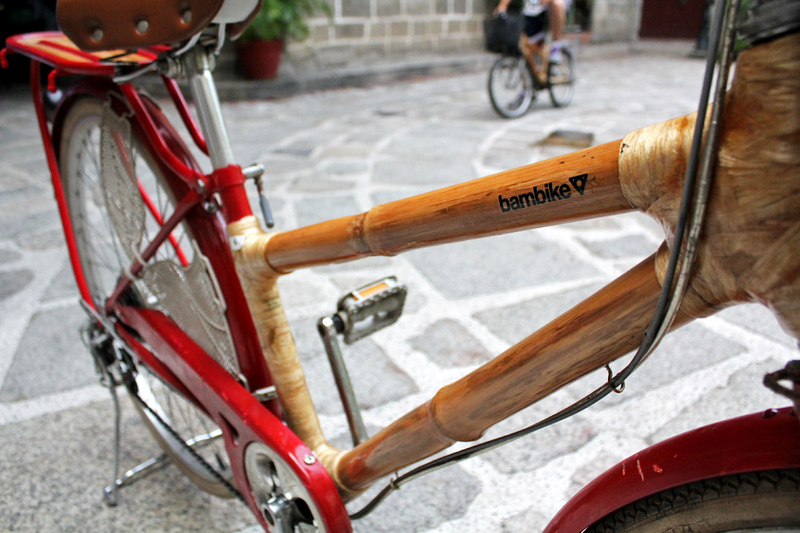 Not only will you be riding in style with Bambike, but you’ll be doing it for a good cause too. 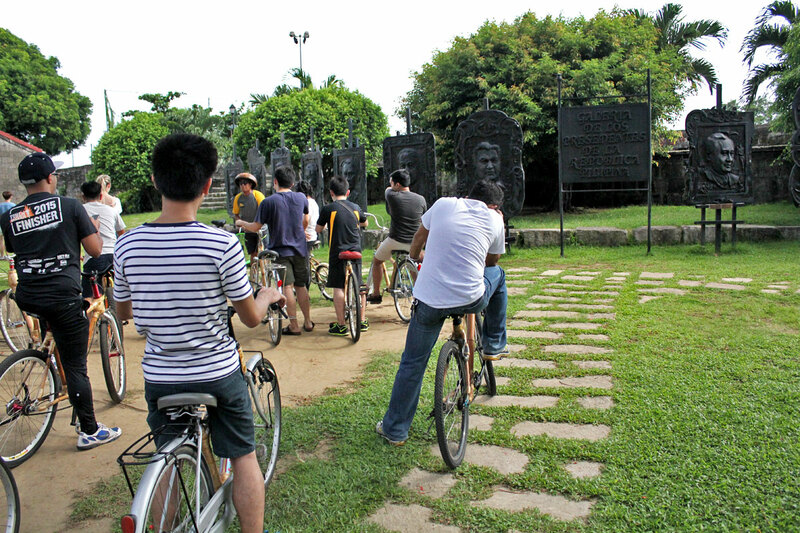 After watching a short video about Bambike Revolution Cycles and Gawad Kalinga, it’s time to pick our rides. Here’s a stylin’ Fatboy bike for cardigan-wearing riders. 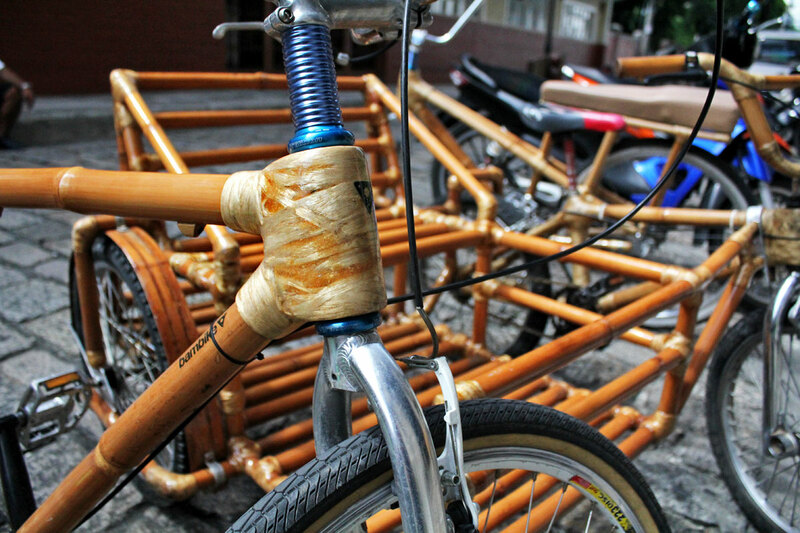 Bike with sidecar made almost entirely of bamboo. 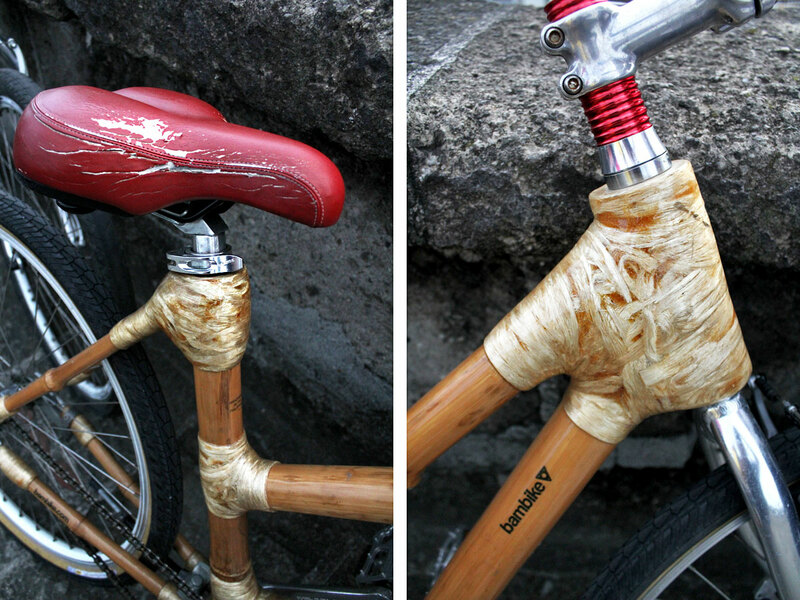 If you don’t know how to ride a bike, then this one’s for you. 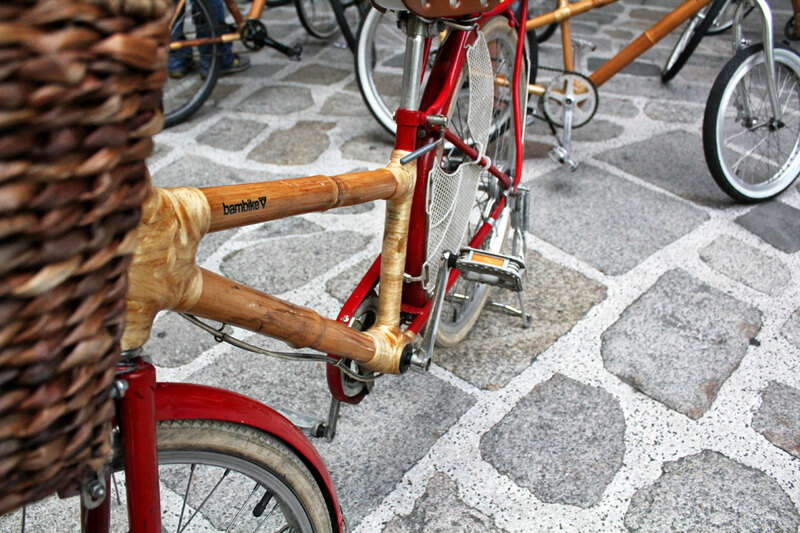 After much deliberation, I finally settle on this beauty — a cherry red Japanese cruiser with matching woven basket. Pretty sweet huh? 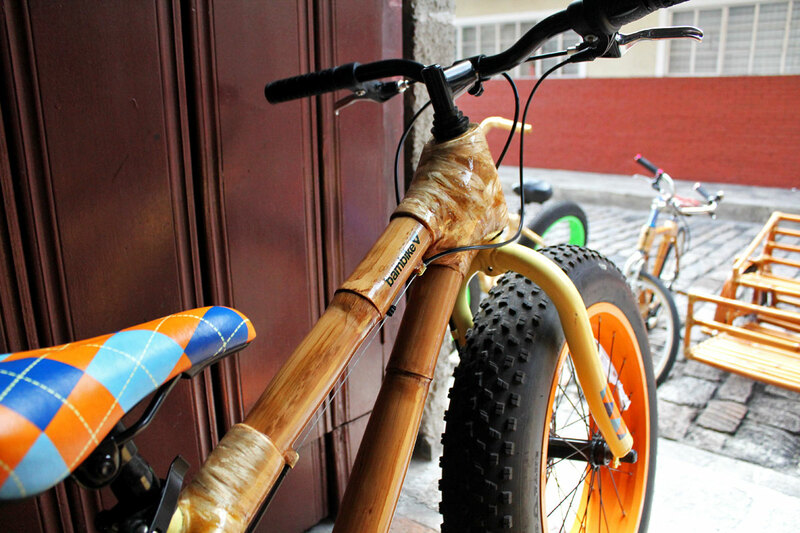 Bambike sells different types of bamboo bikes. These cruisers are the cheapest with complete builds starting at PHP 15,000. Tempting! Bad hair day Rey giving us last minute instructions before we head off. Even the helmets at Bambike are cool. Our gang of eleven ready to ride. Let’s rip up these streets yo! 😆 All in all, I think there were about 20 in our group. I’ll huff and I’ll puff and I’ll burn your house down! 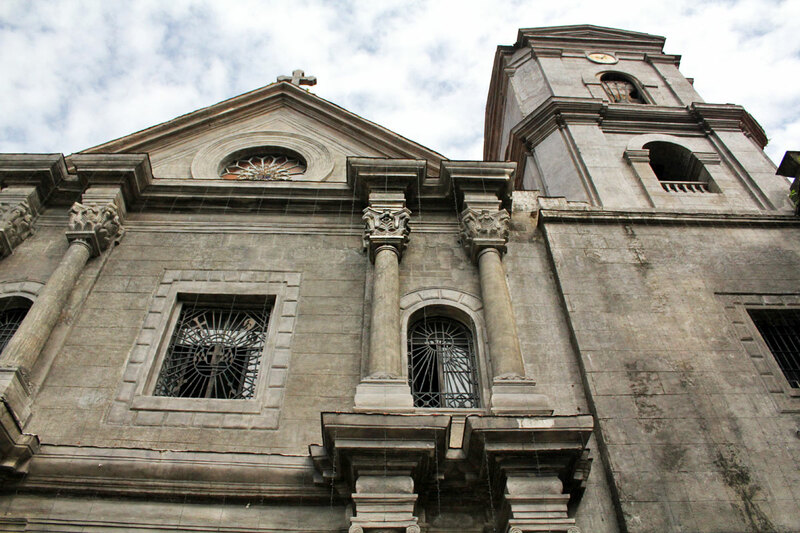 Built in 1607, San Agustin Church is the oldest stone church in the Philippines and the third church erected on this site. 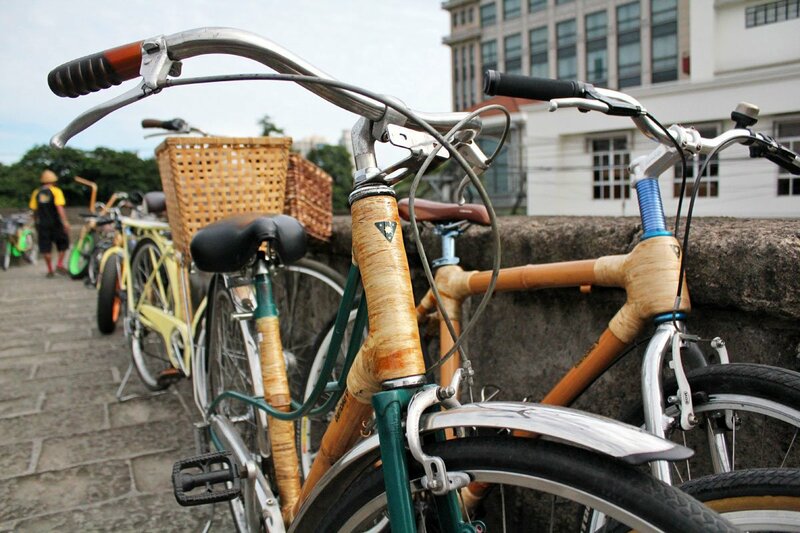 The first was made from bamboo and nipa, and the second from wood. Both burned down. Next up is the Philippine Presidents’ Gallery, which showcases reliefs of past presidents of the Philippines. …a cannon! Boom na boom. We park our bikes here to climb up and walk along the fortress walls. Separated by a golf course, there’s Manila Hotel in the distance. Did you know that Gen. Douglas MacArthur once served as the hotel’s general manager? MacArthur was commissioned by President Manuel Quezon in 1935 to help build the Philippine army and serve as the Commonwealth’s Military Advisor. Together with his family, MacArthur lived at the hotel from 1935-1941, where he was bestowed the honorary title of “General Manager” to help justify the cost. His favorite dish at the hotel was native lapu-lapu wrapped in banana leaves. 1861 or 1981? 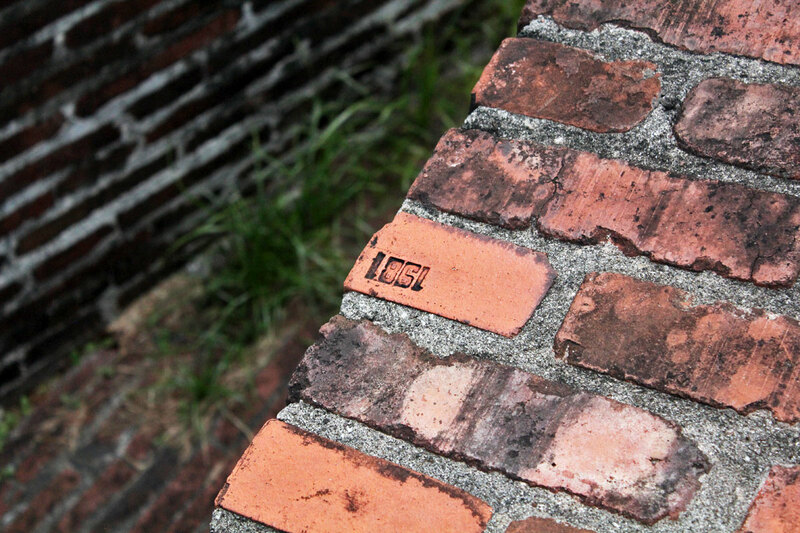 Many of the wall’s bricks have these markings. The latter is correct, signifying the year when much of the wall was restored. Gorgeous bikes eh? That’s The Bayleaf hotel to the right. We’ve never been but they have a great roofdeck bar and restaurant that gives you some of the best views of the Manila skyline. Functional works of art indeed. Love the textures on those lugs. They’re made with abaca fiber and resin. 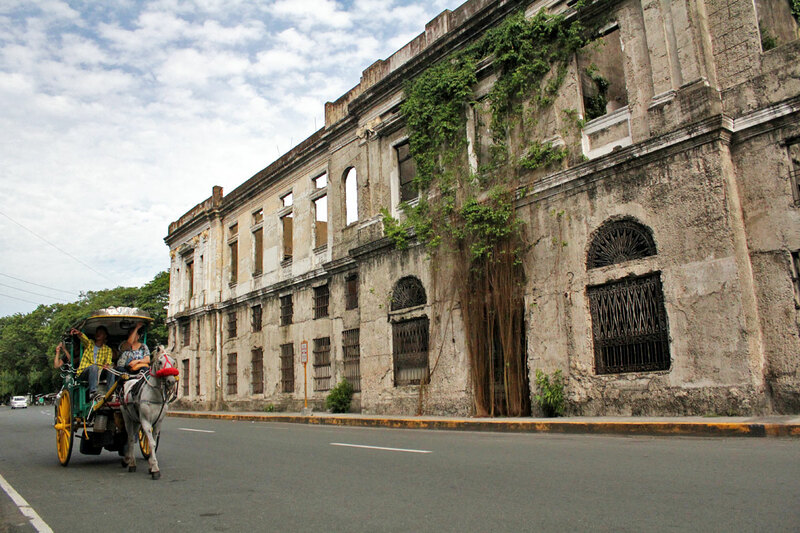 I believe these are the ruins of the Intendencia or civil administration office. Isn’t she lovely? An hour-and-a-half into our tour, Ren’s face says it all — it’s been a long and tiring but ultra fun day. ♥ If I remember correctly, that building to the right was used as a storage facility. It’s empty now so we got to ride our bikes inside. 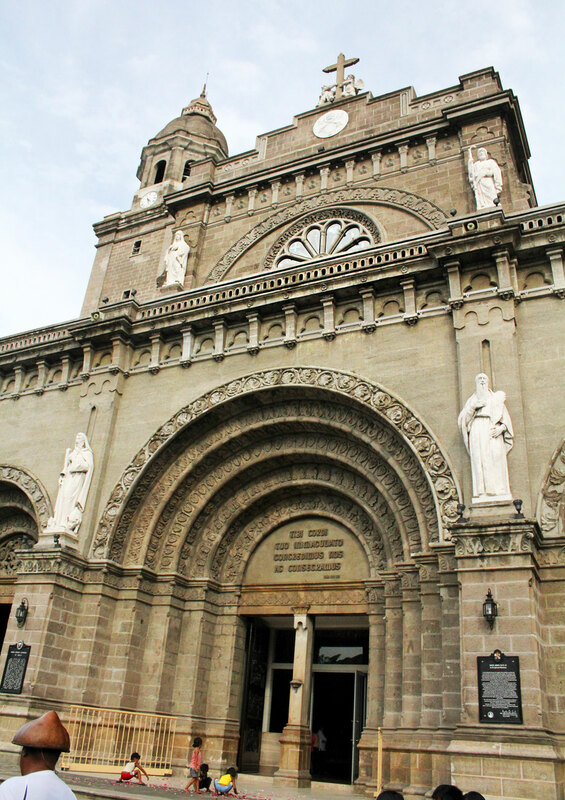 Manila Cathedral. This was where Pope Francis celebrated his first Papal Mass on January 16, 2015, as part of his Papal visit to the Philippines. As beautiful as this church is, urban legend has it that it’s also one of the unluckiest, at least for newlyweds. Many couples have been said to divorce after getting married here. Well, more like separate since there’s no legal divorce in the Philippines. 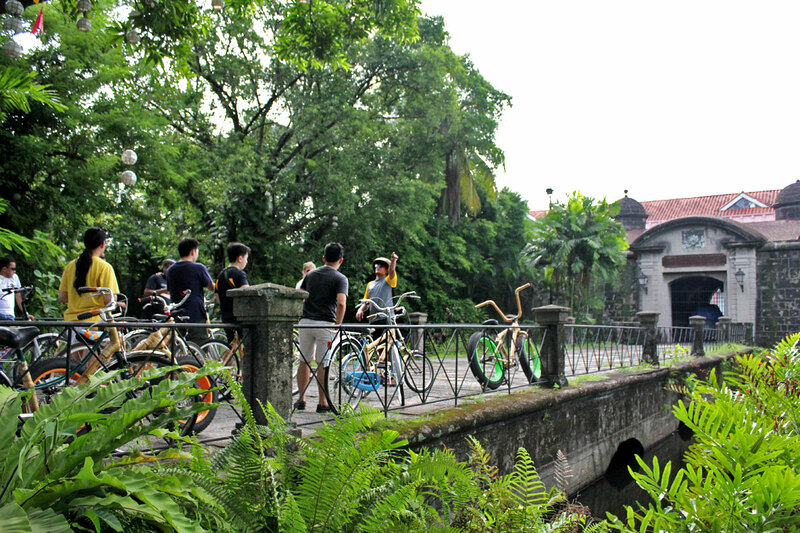 The last stop on our tour, we park our bikes at iconic Fort Santiago, one of the most important historical sites in Manila. 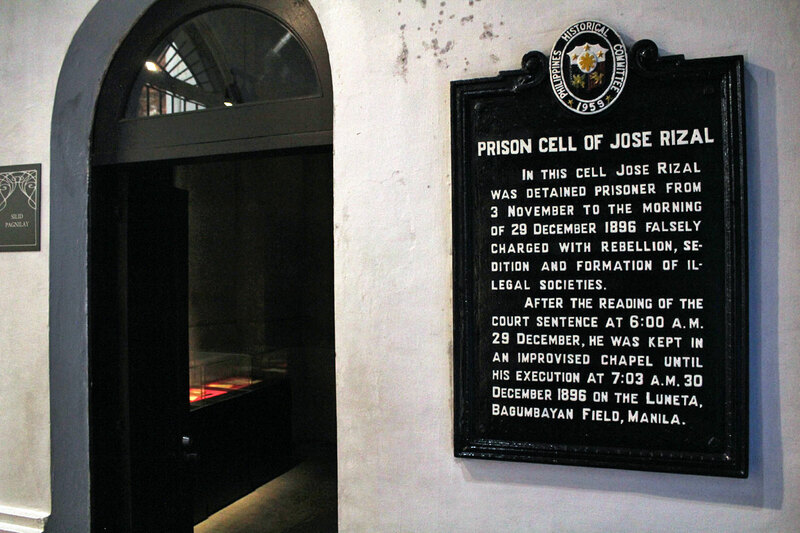 José Rizal, our Philippine national hero, was imprisoned here before his execution in 1896. 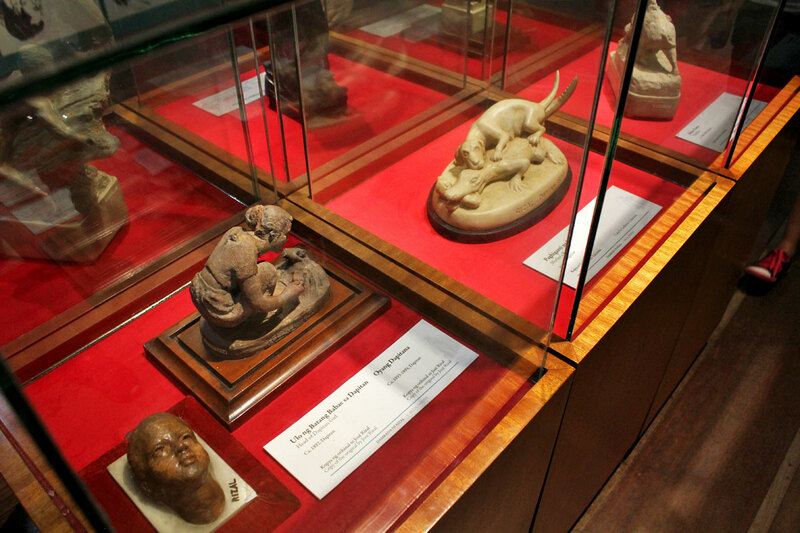 My favorite part of the tour – the Rizal Shrine Museum. Widely considered as one of the Philippines’ greatest heroes, Dr. José Rizal was a nationalist, novelist, poet, artist, opthalmologist, journalist, and revolutionary. He was best known for authoring Noli Me Tangere and El Filibusterismo, two of the most important pieces of Philippine literature that brought to light the corruption and abuse of the colonial government and Catholic Church. Instrumental in creating a unified Filipino national identity and consciousness, those two books are credited for indirectly influencing the Philippine Revolution of independence from Spain. Rizal’s prison cell. 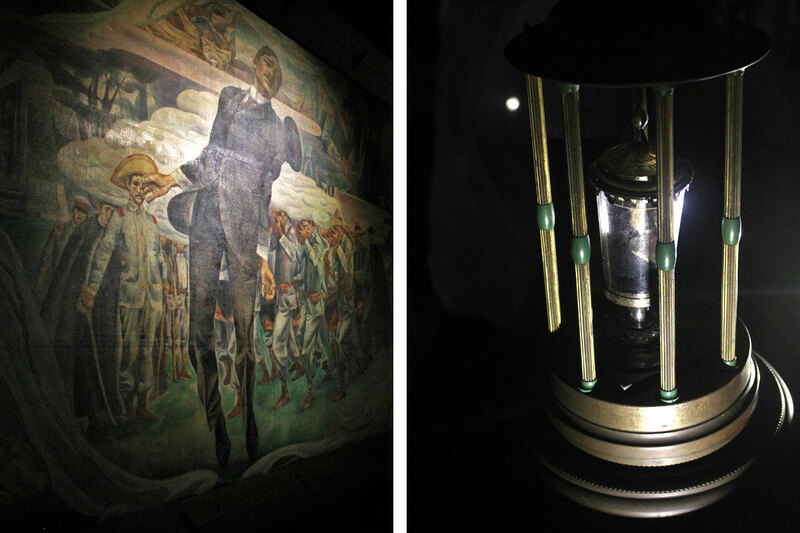 Illustrados like Rizal were imprisoned aboveground while indios were kept in the dungeons. L: The Martyrdom of Rizal. Oil painting done in 1960 by Philippine National Artist Carlos “Botong” Francisco. Executed by firing squad, Rizal is believed to be the first Filipino revolutionary whose death is attributed entirely to his work as a writer. R: This was interesting though somewhat macabre. What you’re looking at is a piece of Rizal’s vertebral column. All of Rizal’s bones are interned under the Rizal Monument in Luneta with the exception of this one. 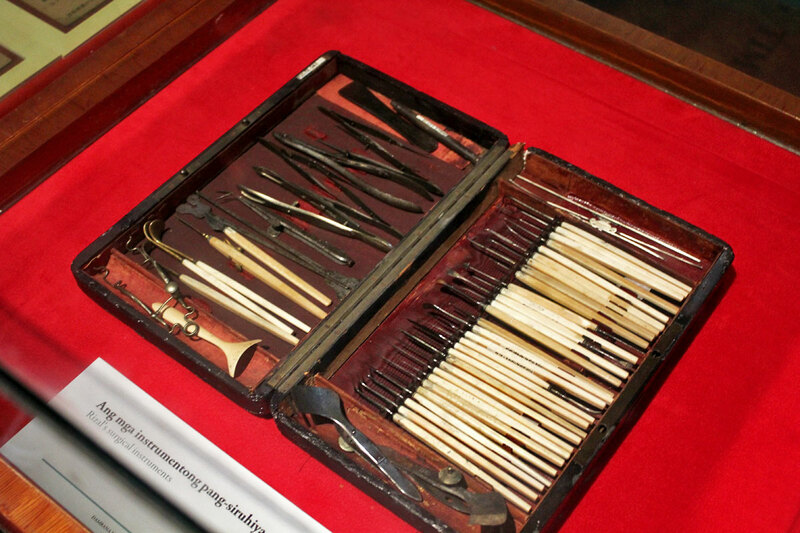 Kept in a glass urn, it’s believed that this vertebra was where Rizal was struck and killed by the firing squad’s bullet on 30 December 1896. 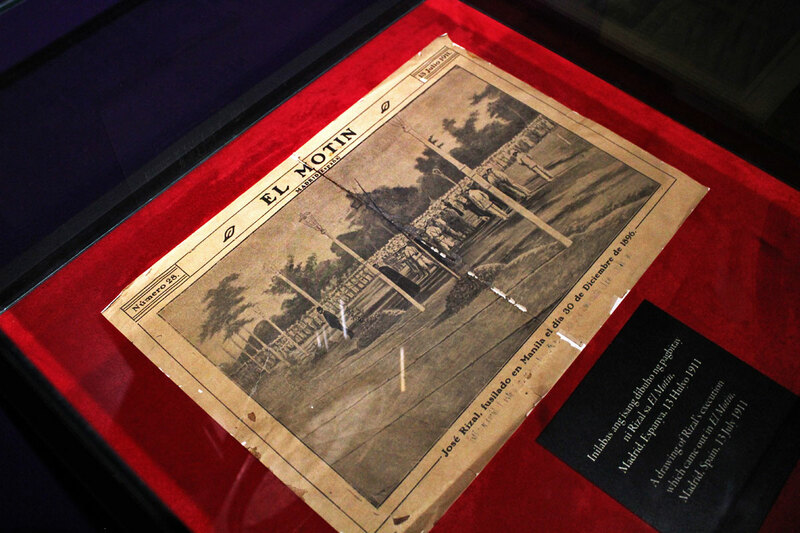 A sketch of Rizal’s execution that came out in Spanish publication El Motin in 13 July 1911. 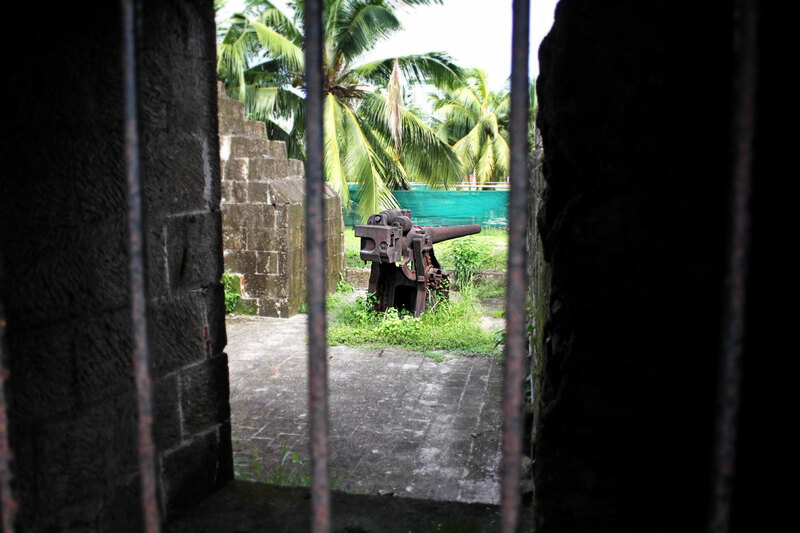 One of the many dungeons you’ll find all around the Fort Santiago grounds. 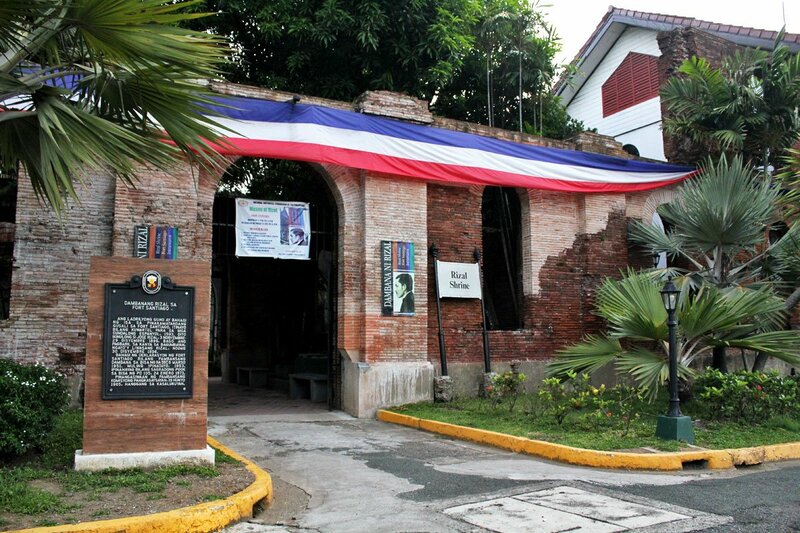 Political prisoners and dissidents were kept here during the Spanish Colonial Period and World War II. 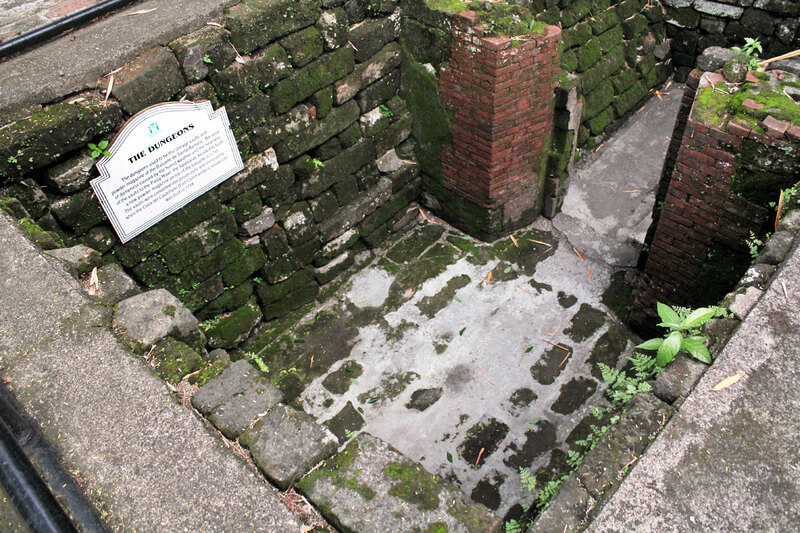 Steps marking Rizal’s march from his death cell in Fort Santiago to the field of his execution in Bagumbayan, now Rizal Park. Steady of pulse until the end, his final words were consummatum est — “it is completed.” It isn’t part of this tour but you can go to Rizal Park on your own to see the Rizal Monument. With the day’s tour coming to an end, we ride back to HQ and take a groufie with Bambike founder Bryan Benitez Mclelland. He’s that tall white dude in the middle. 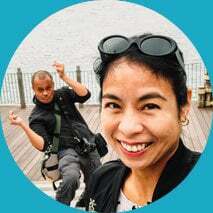 A Filipino-American environmental consultant, Bryan became involved with Gawad Kalinga while working on his Masters degree in Environmental Resource Management at the University of Pennsylvania. 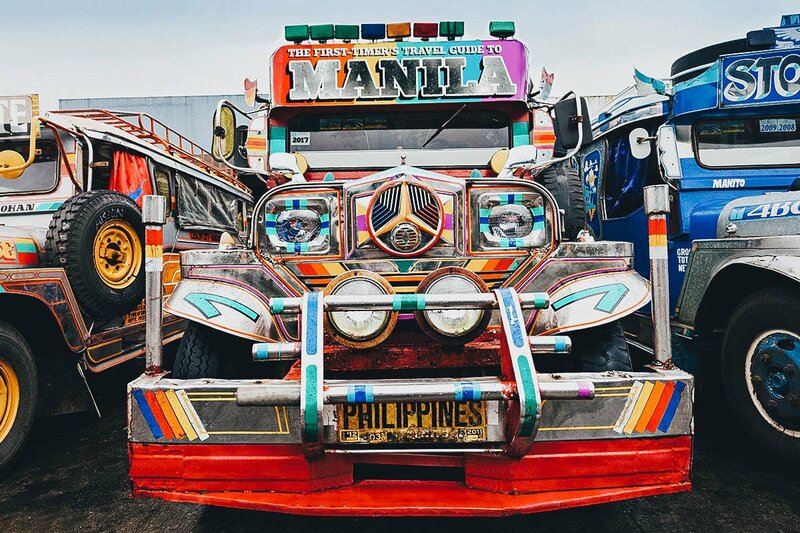 After helping GK kickstart their green building program, he founded Bamb EcoLogical Technology, Inc. as a platform to launch his socio-ecological enterprise projects. 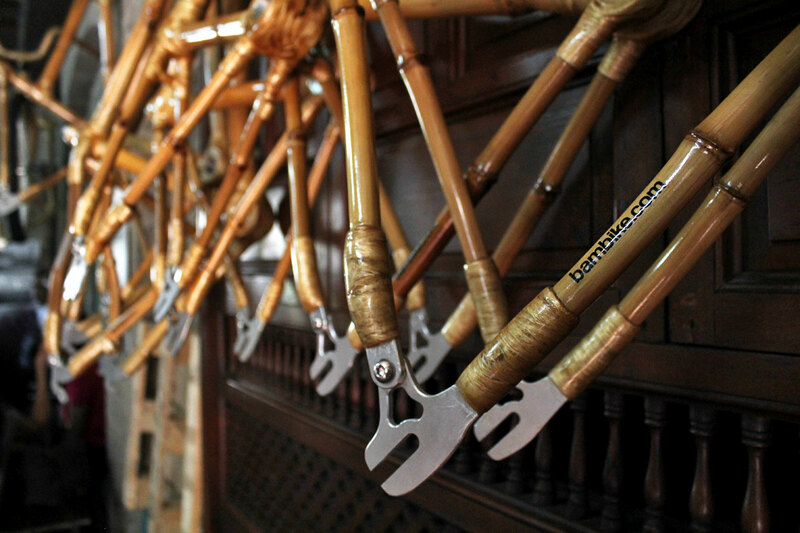 Bambike is the flagship brand of his company. L: This beauty hanging above Bryan’s head is called the Ligtasin Cove and can be yours for a cool PHP 50,000. That is one good-looking ride ese. 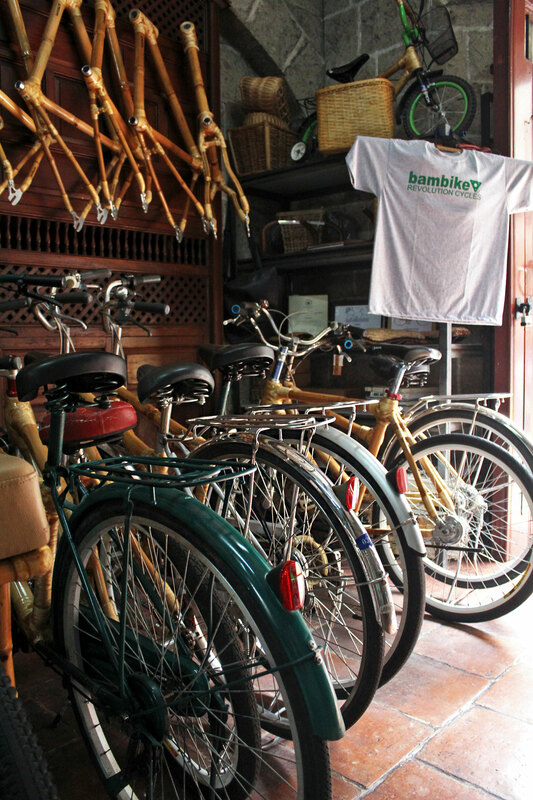 R: Bambike Ecotours holds two 2.5-hr tours daily — at 10AM and 3PM. Bambike Revolution Cycles is open from Tuesday to Sunday, 9AM-6PM. 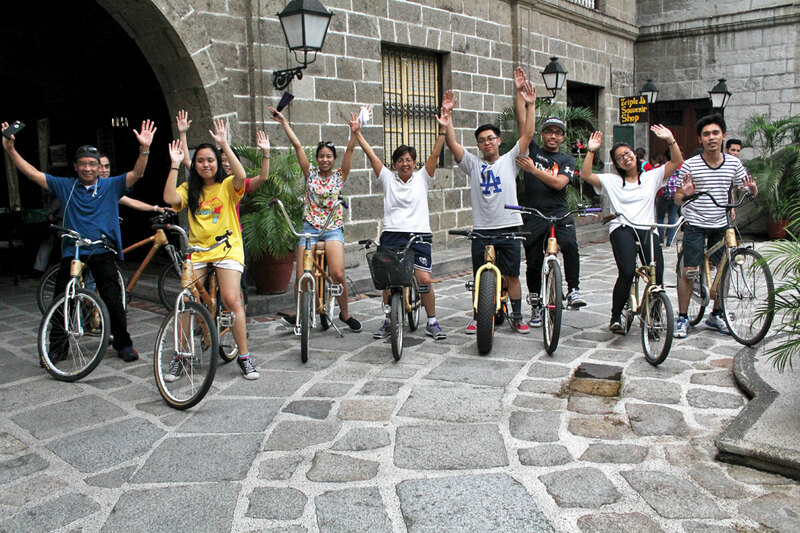 I’ve visited Intramuros several times before but today was the most fun. 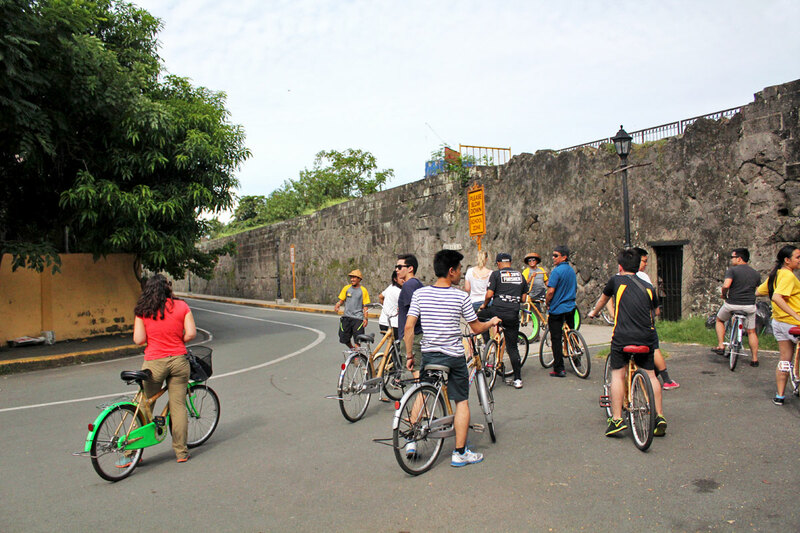 It was a unique experience touring Intramuros on these Bambikes. The fact that they’re made from sustainable, locally-sourced bamboo was cool enough, but to learn that they were being produced in collaboration with Gawad Kalinga made them that much sweeter. I want one. 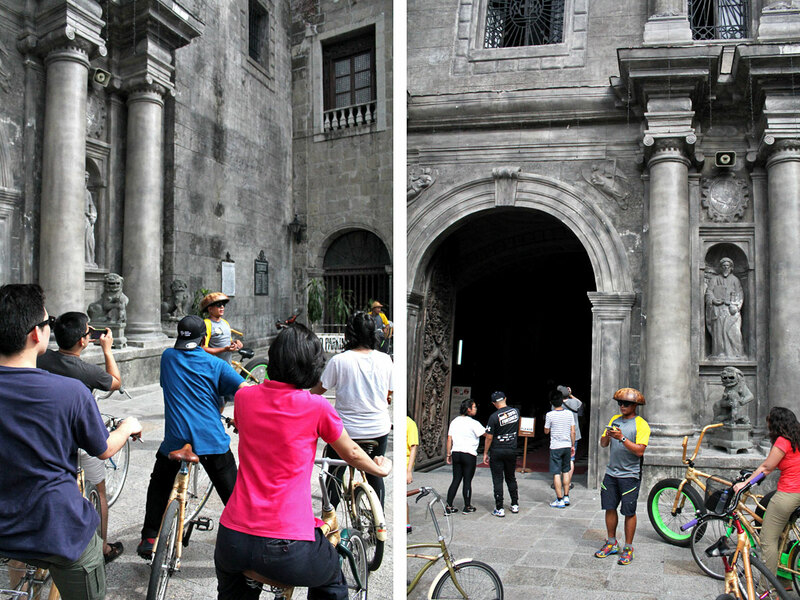 As much fun as Bambike’s tour was, it’s important to note that there are other ways of touring Intramuros if biking isn’t your thing. 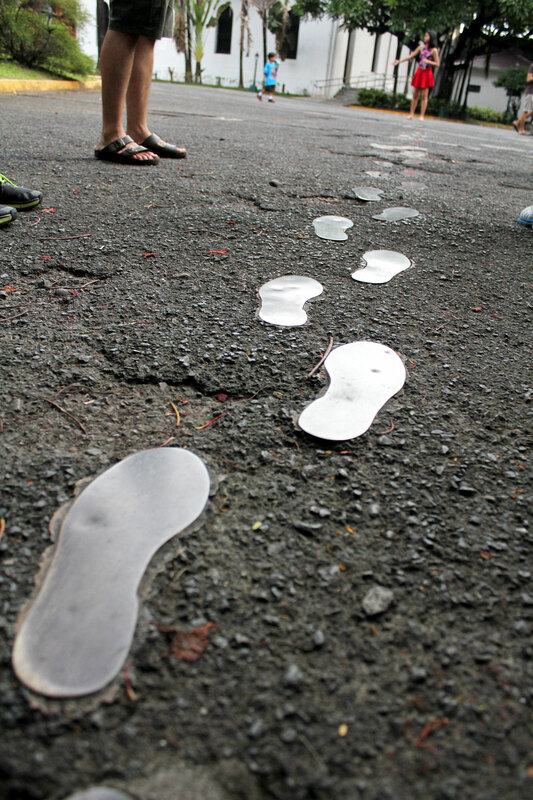 Carlos Celdran’s walking tour comes foremost to mind. I’ve done it twice before and it’s a provocative, wildly entertaining way of getting to know Intramuros. Carlos is animated and theatrical by nature so his tours are some of the most engaging. It’s like watching a one-man performance piece. 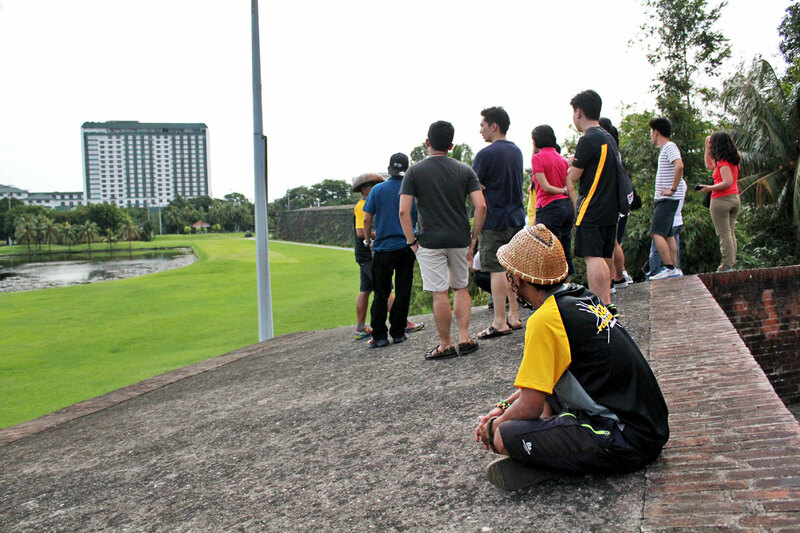 Please be advised though that his Intramuros tour has exploded in popularity in recent years, so don’t be surprised if you’re joined by an exceedingly large number of tour-goers (50+). Whether by Bambike or by foot, one thing’s for sure. 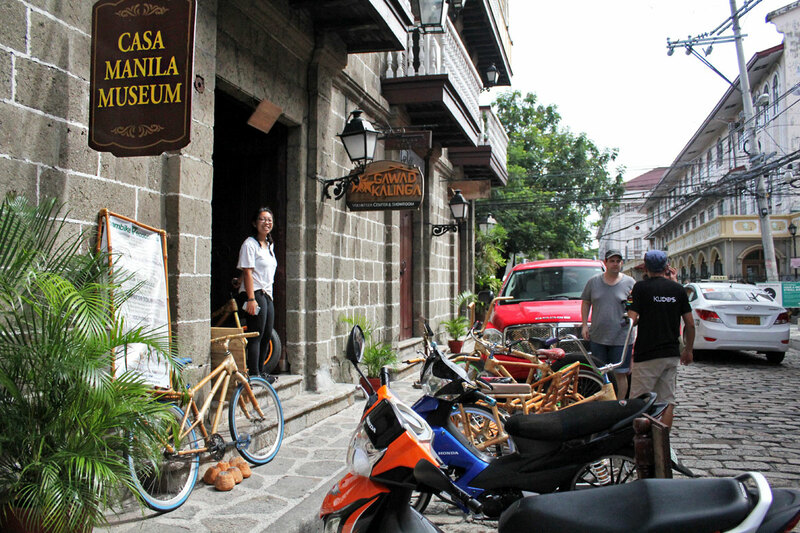 If you’ll be spending a few days in Manila, then Intramuros needs to be on your itinerary. It’s a must-do. 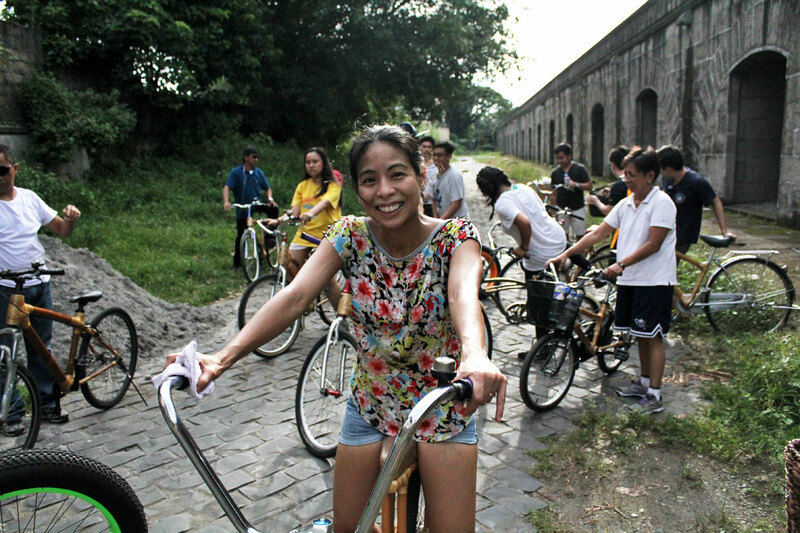 We booked our Intramuros tour directly with Bambike Ecotours for PHP 1,200 each, but you can book it through Klook for just PHP 1,080 apiece. 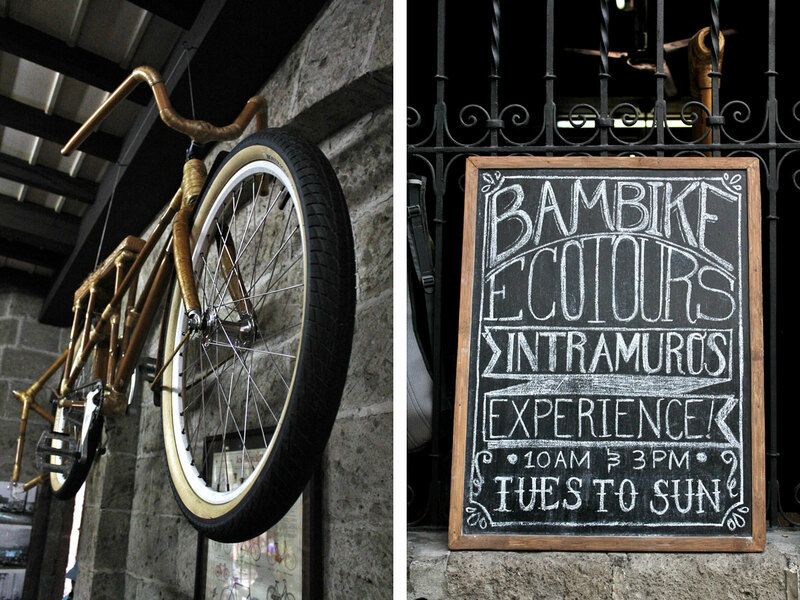 Bambike offers bike tours in BGC and Poblacion as well. This really was a fun (and informative) tour! Great work with the photos and post. We had fun looking for our cameos in you video. We’re looking through your blog now. Love it! Looks like we have some things in common! We stayed practically next door to where you stayed in Ubud, Justin graduated from AAU, and we both have the travel bug!